If you’re planning on selling your Cranford home, call Team Zuhl today for a free comparative market analysis of your home. If you’re thinking of buying a home in Cranford, call us today! If you are a buyer or a seller interested in a home in Clark, New Jersey, please call Team Zuhl! We’re happy to help you in all of your real estate needs! Cranford is a township in Union County that approximately 23,000 people call home. There are currently 95 homes offered for sale in Cranford ranging in price from $179,000 to $1,299,000 – certainly something for everyone. Inventory is starting to drop which is normal in the autumn, but the blue trendline in the following graph shows that inventory over the last 3 years is rising. Eleven homes were sold in October – low compared to the previou 12 months but still increasing over the last 3 years as shown in the red trendline below. The average sale price of a home sold in Cranford in October was $419,820, lower than the 12 month average of $444,545. Homes in Cranford continue to sell quickly. The average home in Cranford was sold after 32 days, faster than any other month since october of 2013 and significantly faster than the 12 month average of 52 days. If you’re considering listing your home for sale, it’s smart to be sure that it compares favorably to others on the market at this time. Make necessary repairs, perhaps even invest in small upgrades, and your home ay sell quicker and at a higher price. How long does it take to sell a home in Cranford, NJ? There are currently 132 homes offered for sale in Cranford. This summer has seen the highest inventory in Cranford in several years. Higher inventory sometimes leads to a decrease in prices. 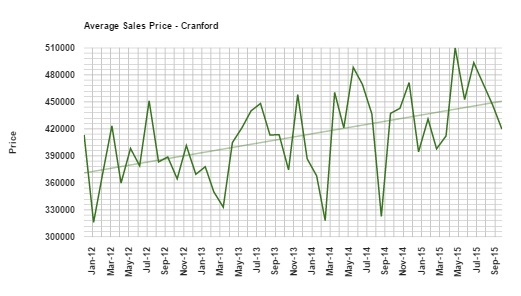 There were 22 homes sold in Cranford in June. The average price of a home sold in Cranford in June was $470,048. This is about 9% higher than the twelve month average sale price. May of 2015 had an average sale price of $510,020 which is the highest average sale price in several years. Sellers who want to get top dollar for their home will want to be sure that their marketing is on point and that their home is appropriately priced. Buyers who are looking for a bargain in Clark will want to do their research. When you find the home you want to buy, be sure that your offer is competitive because there are many multiple offer situations this summer. Homes in Cranford sell quickly. 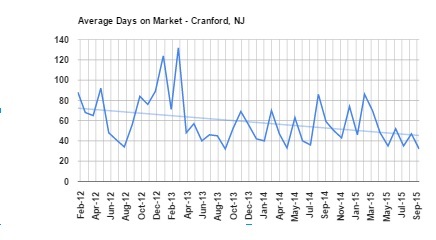 The average home that sold in Cranford in June was sold after only 32 days on the market, and the 12 month average in Cranford was 56 days on the market. Home sellers who are interested in selling their property quickly will need to be sure that the home is priced correctly. Overpriced homes sell much more slowly, if they sell at all. Condition also affects the speed at which a home will sell. Homes that are cleaner, more up to date, and in better condition will sell faster than others. Winter is the slowest time in Union County Real Estate. Not only do homes take longer than average to sell in the winter, they also sell for less in the winter than they do the rest of the year. But don’t think for even one moment that Cranford’s real estate market is dead in the winter! This winter, Cranford had 94 active listings and 34 sold listings. The average sale price this winter was $403,299 with the average home selling after 69 days. How does the winter of 2014-15 compare with previous years? Fewer homes were sold this winter (34) than last winter (42). Inventory is higher this year (94 listings) than last year (81). The average sale price in the first quarter of 2015 was $403,299 compared with an average sale price of $363,056 last year. The average home sold after 69 days this winter compared to 51 days in 2014.